AMD’s Ryzen processors are quietly taking over the mid-range PC gaming market, and that’s a good thing for anyone looking to give PC gaming a try — or another try, if you’ve been out of the game for a while. After all, the less you spend on a processor, the more GPU you can afford. Our Asus G11DF review illustrates just how far you can go on a budget. The Asus G11DF starts at $1,000 and features a Ryzen 5 1400 processor clocked at 3.2GHz, with 8GB of RAM, an Nvidia GeForce GTX 1060 graphics card, a 256GB solid state drive, and a 1TB hard drive. That’s a lot of computer for less than the cost of, like, 500 cups of coffee — or 250, if you dig no-whip white mochas. Anyway, let’s see how it stacks up to the competition. The G11DF, that is. Not the mochas. The ancient Mayans were, apparently, fans of budget PC cases from the mid-2000’s — because that’s what the G11DF looks like. Even without the potentially problematic “inspiration” for the exterior design, it’s not a great look. The G11DF does everything it can to remind you that it’s a budget PC by slapping cheap lighting panels all over the place. The case features two lighting panels on the front, one on the side and one tucked awkwardly against the front edge of the case. All of them are rather small, and poorly lit. Some of them don’t even light up all the way, and they all look like they belong on a much cheaper PC. You can change the lighting from Asus’ included ROG utility, and that’s easy enough, but it looks best with the lighting just turned off entirely. That’s mostly because only one of the lights actually changes. The rest are behind red-colored panels, so they’re red no matter how much you tweak your settings. The G11DF is a lot smaller than an average gaming PC, with a Micro-ATX form factor. It offers a refreshing contrast to bigger, bulkier budget desktops like the Dell Inspiron 5675. A small gaming desktop can be a boon for gamers who live in a small apartment. It’s also easy to move the G11DF if you’re a fan of LAN parties. AMD is bringing serious heat to the processor market, and that’s good news for everyone. The desktop has a lot of ports, and they’re all conveniently located. On the back-side of the Asus G11DF you’ll find three audio input-output ports, an Ethernet port, two HDMI ports, two DisplayPorts, and a whole mess of USB ports. There are enough USB ports to let gamers plug in a smartphone, a tablet, an external hard drive, a USB fan, a mouse, and a keyboard — and still have an extra USB Type-C port to plug in a Nintendo Switch. Plus, there’s four more USB Type-A ports on the front-side of the case, for a grand total of 10, along with an SD card slot. The G11DF also features built-in Wi-Fi and Bluetooth functionality, so no need for a separate Wi-Fi card or USB dongle. Internally, the Asus G11DF is a bit cramped, mostly due to its form factor. Built inside a Micro-ATX case, the Asus is smaller than your average desktop PC, and that means interior space is limited. However, the internal components have plenty of room to breathe, and cables are managed nicely — with one exception. There’s an open RAM slot for future expansion, which is great, but there’s a big knot of cables in the way. To access the RAM slot, you have to shove them to the side, and even then it ends up resting against the new RAM. Plan to reconfigure the internal cables if you opt to use that RAM slot in the future. The Asus’ layout is like the larger Dell Inspiron 5675, but with less space overall. There’s an open hard drive bay, since the M.2 SSD lives on the motherboard, and the only hard drive bay in use houses the 1TB hard drive. However, the motherboard only features one additional SATA plug, so you’ll only be able to hook up one other internal storage solution. 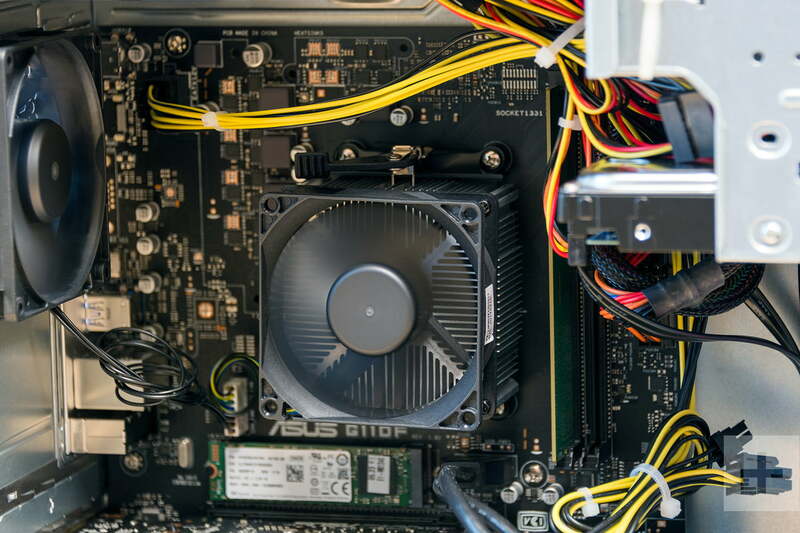 The Asus G11DF and Dell Inspiron 5675 desktops feature metal brackets that mount the graphics cards to the interior of the case — a precaution to keep them from getting unseated during shipment. If you plan on upgrading your graphics card in the future, it’s not a bad idea to just pop that bracket out. Be sure to store it somewhere safe, in case you ever need to ship the G11DF for repairs. That bracket also gets in the way of the SATA ports on the motherboard, so if you plan to do anything with the hard drive, you’ll have to do a little surgery. At the price range where the Dell Inspiron 5675 and Asus G11DF reside, a less-than-spacious interior is par for the course, and more than adequate for most users. The snug interior isn’t an immediate issue, but it might become one when it comes time to upgrade the system. By offering processors with solid all-around performance at prices that slightly undercut their Intel competitors, AMD is bringing some serious heat to the processor market, and that’s good news for everyone. The Asus G11DF benefits from that ongoing battle, pairing an AMD Ryzen 5 1400 processor with an Nvidia GeForce GTX 1060 graphics card. This configuration aims to effectively balance price and performance. In our Geekbench tests you can see that the 3.2GHz Ryzen 5 1400 in the Asus G11DF performs about as well as it should, coming in just ahead of the Dell Inspiron 5675, which also featured a Ryzen 5 1400. It’s still behind a processor like the Intel i7-7700, but that’s one of Intel’s top-end offerings, and one of the quickest processors you’re likely to see in a gaming desktop under $2,000. It’s important to look at how well the Ryzen 5 1400 does against the Intel i7-7700 because both are quad-core processors with Hyper-Threading, so they’re comparable in workload and multi-tasking capability. The i7 beats the Ryzen 5 by a comfortable margin, which you would certainly notice if you were running apps like Adobe Photoshop or Premiere with any amount of regularity. It’s not the quickest we’ve seen, but for a processor in the $160 to $170 price range, it’s an admirable performance. For gaming performance, however, that margin is small enough that you could definitely get by with a Ryzen 5 1400, without noticing any serious reduction in overall performance. You might lose a few frames here and there, but a GPU like the GTX 1060 is more than capable of picking up the slack. In our Handbrake test, we can see how the Ryzen 5 1400 performs with a real-world task: 4K video encoding. The Ryzen 5 1400 finishes strong, completing the encode in just nine and a half minutes. It’s not the quickest we’ve seen, but for a processor in the $160 to $170 price range, it’s an admirable performance. The Dell Inspiron 5675 took a little longer than its Asus counterpart, illustrating that even identical processors aren’t exactly identical. There is always some small variations in performance. Still, these two competitors were within a hair’s breadth of one another. Looking at the Asus G11DF and Dell Inspiron 5675 side-by-side you’ll notice there are a few key differences, despite their striking similarity. Not only do they possess different graphics cards, but their storage solutions offer an important point of distinction. As you can see here, the Inspiron’s mechanical 1TB hard drive is a lot slower than the G11DF’s 256GB SSD. That’s not much of a surprise, as mechanical drives are almost always slower than their solid-state counterparts. The difference here is that the Inspiron only has one hard drive, so you’re stuck with those slow speeds unless you upgrade at checkout, which is an option (Dell charges $100 for the SSD at time of this writing). The Asus G11DF, on the other hand, ships with two hard drives — the aforementioned 256GB SSD, and an auxiliary 1TB mechanical hard drive. That way you not only have all the space you need, but you also have a quick 256GB SSD for your core applications — and games. Mostly games. Here it is, the moment of truth. The G11DF may have weird external design, but that won’t matter if it blows away our benchmarks. You can always tuck it under a desk. Right off the bat, you can see how the key difference between the Dell Inspiron Gaming Desktop and Asus G11DF play out in our 3DMark tests. It’s a timeless battle, AMD vs Nvidia. The GTX 1060 still comes out on top, despite a strong showing from the Radeon RX 580. To be fair, it’s closer than it should be given that the RX 580 is typically a cheaper graphics card than the GTX 1060 — or it would be, if not for bitcoin miners and shortages. Let’s see if those margins carry over to in-game testing. Both the Inspiron and the G11DF offer impressive performance at 1080p, but the Inspiron pushes ahead of the G11DF in a few games, despite the 3DMark result. Looking at Battlefield 1 for instance, the Inspiron hits 93 frames per second on average at ultra-high settings, while the G11DF hits just 77 FPS at the same settings. That’s a noticeable difference, the kind you’d actually feel during gameplay. The margin narrows a bit in Deus Ex: Mankind Divided, with the Inspiron hitting 46 FPS on average at ultra-high settings, to the Asus G11DF’s 41 FPS. That’s a much smaller margin, and it’s indicative of how different games handle GPU resources. Moving up to 1440p, neither the Inspiron nor the G11DF have the horsepower to make the most of games at this resolution. Games were playable but, they weren’t anywhere near as smooth as they were at 1080p, and the G11DF even fell below 30FPS at one point. In Deus Ex: Mankind Divided, for instance, the Asus G11DF’s GTX 1060 barely managed to hit a consistent 29 FPS, and frequently fell below that during actual play at 1440p. It’s a timeless battle, AMD vs Nvidia. The Inspiron’s AMD Radeon RX 580, on the other hand, kept up at 42 FPS on high settings. During gameplay, the framerate stuttered here and there, but it was noticeably smoother than the GTX 1060 had been. In Battlefield 1, both PCs offered decent if less-than-stellar performance, with the Inspiron hitting 65 FPS at ultra-high settings, to the G11DF’s 51 FPS. So, games are still playable at 1440p with the G11DF’s GTX 1060, but with all the settings maxed you’ll definitely see some stuttering here and there. We certainly did. The Asus G11DF comes with a number of Asus ROG-branded utilities pre-installed, none of which are obtrusive, and all of them serve important purposes. There’s one notable exception though, and you probably know what it is: McAfee. Once you fire up the G11DF for the first time, before you even install Chrome, just open your Start menu and type the word “uninstall.” That’ll pop open your uninstallation utility. From there, you’re only a few clicks away from purging McAfee from your system forever, and all time. Once you strike off those chains, check out those Asus utilities. One of them even lets you change the color of your PC’s lighting. The Asus G11DF ships with a mouse and keyboard to get you started, and you’ll want to part ways with them as soon as you can. Neither is responsive, or suitable for gaming. The keyboard in particular feels slow, even just when you’re typing. The keys are squishy, and have just slightly too much travel. On top of that, it features a bizarre silver paint job. It looks like it was spray-painted. The mouse is more serviceable, but it’s just a standard cheap mouse – worse than what you could pick up on Amazon for $10. You’d be much better off picking up a new mouse and keyboard than using these two for long. The Asus G11DF comes with a standard one-year warranty against manufacturer defects. It’s not the most generous warranty period for a gaming desktop, but for a $1,000 PC, it’s to be expected. The Inspiron, for instance, also features a one-year warranty. Asus’ G11DF runs modern games well enough that you won’t notice any serious slowdown for the next couple years, and it keeps up during everyday use. This desktop does have strong competitors, though, and they keep the G11DF on its toes. The Dell Inspiron Gaming Desktop, equipped with a Radeon RX 580 graphics card, keeps the Asus G11DF honest. At just $950, the Inspiron is the obvious alternative. It outperformed the Asus in a few games, and came close in others. We did find flaws in the Inspiron, however, the most serious being its lack of a standard SSD means. You’ll have to either upgrade, or deal with slow load times. There’s also the Acer Aspire GX-785-UR16, an Intel-based gaming desktop sold for around $900, depending on the configuration. It is a step down from both the Inspiron and the G11DF, though, since it starts out with an Radeon RX 480 graphics card, which the G11DF’s GTX 1060 outperforms. The Asus G11DF is well-built, despite its unfortunate design sensibility, and it’ll likely survive a few years of hard wear. The internal components are going to show their age before long, especially if you’re gaming at 1440p. At 1080p, you’ll be able to squeeze a bit more life from that GTX 1060, and it’ll probably see you through the next couple years of major game releases without any hiccups. Just keep an eye on your settings, as you’ll have to start turning things down sooner rather than later to maintain a decent frame rate. Probably not. Yes, for just $1,000 you end up with a reliable gaming rig that’s quick, capable, well-built, and small. That’s great — but for the same money, you could pick up the Dell Inspiron Gaming Desktop, which offered slightly better gaming performance than the G11DF in our tests, and looks far more impressive. The Asus is only preferable if you need a small desktop that will fit in a snug den or office.